We’ve just added our newly designed SPORT FASHION PULLOVER HOODIE (for men and women), to our Fashion Art Collection. This garment offers practical along with fashion forward and high-performance features. With each pullover hoodie, you’ll receive a drawstring travel pouch specially designed to hold the hoodie when rolled up. Great for light travel! This garment is a sleek and simple and is great for travel, sports activities and is a strong fashion statement. If you choose to wear this pullover as a form fitting garment, order the size that best reflects your body shape according to our size charts. If you wish to wear your hoodie larger and loose fitting, just select 1 to 3 sizes larger than your body shape according to our size charts. Our pullover hoodie is constructed using high tech compression fabric, which offers the highest wicking properties, keeping you cool in warm weather, and warm in cool weather. The Della Penna Fashion Art Collection concept was created in 2006 by founder Michael Della Penna. To date we have produced hundreds of prototypes of our Fashion Art Collection with a variety of bold graphic prints with bright contrasting colors. We are ready to manufacture and launch our line, but we need your backing for funding in order to produce extra inventory and begin marketing our concept on a national level. Our entire collection is constructed with the highest quality, technically advanced compression fabric that possesses high moisture wicking, and anti-microbial odor killing technology, and it's made in the USA. Most importantly, all garments are hand and laser cut, then sewn by our expert team of highly skilled craftswomen. The printed apparel pieces that we are offering are some of the most fashionable and popular designs in the sportswear market. We believe that this collection offers something for everyone that loves art and modern fashion. This campaign includes: high-end hoodies, leggings, shorts, vests, tops, a couture style jacket dress and cross body purse. The Video Gallery below showcases select video clips of our Fashion Art Collection which includes our Fashion Fuchsia pieces that we are offering in this project. Please take a look at our virtual tour below that was taken with a 3D Matterport Camera. You’ll be able to experience an extremely fluid virtual step by step walk-through of our mannequins wearing select pieces from our Fashion Art Collection. 3D tours increase emotional engagement that is beyond conventional static photography. You’ll be able to see up, down, and all around. How to Navigate a 3D Interactive Tour: You can use your mobile device [phone or tablet] or your computer. With the devices you can use your finger to move the circles, and with your computer you’ll use your mouse to bring the blue circles and white circles together and click to see each body form close up. For a walk-through of the room just drag your mouse and use your scroll wheel for a closeup view of the collection pieces. Dear backers, we need your support by backing our project in order to reach our goal and hopefully beyond! Because our Fashion Art Collection is made in the USA and manufactured locally, it does cost more to create, but we have reduced our prices as low as possible on most of our rewards so that we can make this exclusive high-end quality art and fashion experience very affordable, and still be able to have enough funding at the end of our campaign to launch our collection. The concept of this project is about the creative process, which is the act of making new connections between old ideas. We embrace the philosophy that creative thinking is the task of recognizing relationships between concepts. Unlike our competitors, our fashion is all about our own creative Original Art Component, and it’s not just printed on our leggings, but printed on everything that we manufacture! Because our collection is all about the art, we believe that our concept can be considered a fundamental form of art therapy but without a therapist. It’s clinically proven that visual art encourages and stimulates the expressions of emotions, helps promote healing and is self-empowering. Myths are collections of stories by which we explain our beliefs and our history. Beneath the story-lines, myths usually confront major issues such as the origin of humanity and its traditions, and the way in which the natural and human worlds function on a profound, universal level; thus, providing a rich source of creativity from which to draw inspiration. Our Vision and Inspiration: Michael Della Penna is a student of Art History and has always believed that Art and Fashion have inspired each other since the beginning of creativity. Both need the elements of strong colorways, textures, forms and both contemporary and indigenous cultures in order to offer an aesthetic experience that is pleasing to the eye. These are common threads that are shared in vision and inspiration. Our brand concept fuses our original art and premium fashion design to create an innovative and distinct women's fashion athleisure sportswear trend collection. Our vision is comprehensive, and draws creative inspiration from diverse cultures, pop art, costumes, iconic designers, classical art history, legends, religion, avant-garde forms and stories of mythology. This Inspirational Mood Board is a visual summary of our collection's inspiration and theme. Our design process begins with a concept of merging inspirational art and fashion together. The ideas are refined by creating sketches of our vision. This step could take many months if not years, which includes many test fits on body forms and live models. Once we decide on the art and fashion designs, we develop a strategy on how to make it come to life. Choosing the printing methods that best work with our art vision on the correct fabrics is an important step, along with developing prototype fashion designs that best reflect our original art. The art is then prepared for printing. We utilize two unique graphic art placement methods to prepare our fabric for printing, which include art print repeats and a detailed engineered art placement method of each pattern piece. With both methods, the fabric is printed with a sublimation dye technique that uses heat sensitive inks. These inks turn into gas under the influence of heat and combine with a polyester/spandex medium. Since the ink becomes part of the structure of the material, the images on the fabric don’t fade or crack - even after multiple washings. The final product from the engineered placement print is then precisely cut using a high-tech laser method. Fuchsia Collection: We are offering four separate apparel pieces from our Fashion Fuchsia Collection as gifts. These include our sleeveless top, our tank top, and our capri style leggings. They are offered with select pledges. Our Fashion Art Collection is available in 5 beautiful graphic art prints that are specially designed to be placed on our fashion apparel. Each print begins with a vision on how to create the most powerful aesthetic artistic impact to everyone who wears our apparel and to the people that they meet. Our art begins with hand drawn and hand drafted shapes then enhanced with digital enhancement using a combination of special effects and contrasting colors. Print #1_Special Effects: An abstract digital image Inspired from an original multi-media drawing, titled 'Special Effects' because the main image of the face has been morphed into an ellipse, a rectangle and warped by a vector effects tool. Print #2_Two Croquis: The word croquis is defined as a sketch used to describe fashion drawings. The two croquis in the image are wearing two distinct patterns, with contrasting back grounds, morphed shapes, and an appropriation of Elizabeth the second. Print #3_Punk Hair/White: A profile sketch of an androgynous face wearing an Avant Garde hair style and a tattoo of Ohm on the neck. Individual shapes of the character are isolated with drop shadows, then transformed by digital enhancement and is placed on a white background. Print #4_Punk Hair/Black: A profile sketch of an androgynous face wearing an Avant Garde hair style and a tattoo of Ohm on the neck. Individual shapes of the character are isolated with drop shadows, then transformed by digital enhancement and is placed on a black background. Print #5_Winged Warrior Girl, our featured image: Inspired by the ancient Etruscan warrior goddess. What does Made in the U.S.A. mean? Our product is printed and manufactured in America, unlike other fashion brands who out-source to factories outside the US. By manufacturing our product in the U.S.A our profit margin will be lower than if we chose to seek out overseas factories. By producing our product in the United States, we offer you, our backers, the opportunity to help support our new company and the national economy. American manufacturing means investment and finance for the American economy. The more that this reasoning is pushed into national manufacturing, the more the nation’s economy will reap the benefits. With growth in American manufacturing, comes a surge in investment opportunities. Our goal is to launch this collection and offer our designs to a rapidly growing women’s athleisure/sportswear market. With your backing this vision can true. With 65% of our funding, we'll be designing new graphic art printed on fabric, and create new fashion designs, such as more dresses, skirts, jumpsuits and jackets. We will then be manufacturing more pieces to expand our collection and to increase our inventory. 10% of our funding will be committed to hiring a videographer and photographer to produce and create strong images for PR to increase brand awareness on social media. 25% of our funding will be allocated to updating all of our social media platforms and an online marketing budget. This will include search engine marketing (SEO & SEM). This will capture a share of online displays such as pay- per- click (PPC) banner ads, online videos, etc. to direct traffic to our new website and shopping cart. 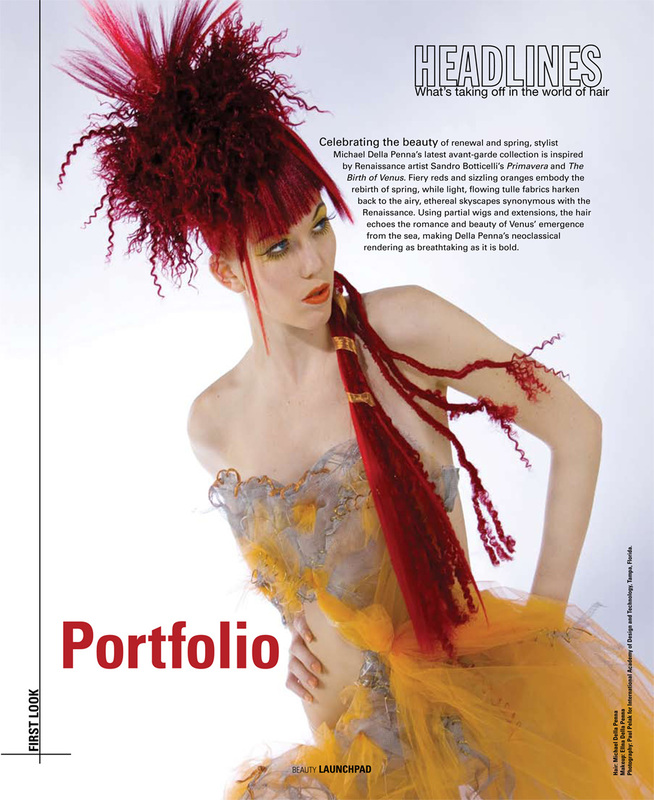 Over the years we have accumulated numerous articles and material from various publications related to hair, fashion and art. The following are select articles, a video from a wearable art fashion show, and a Tampa Bay Fashion Week blog talk radio interview with Michael. The video below shows select clips from the Wearable Art Fashion Show at the Dunedin Fine Arts Center in Florida. The costumes, designed and created by Della Penna, are a complete collection titled ‘The Aluminum Fashion Experiment’ that focused on 3-D abstraction art, constructed and formed with aluminum screen, wire with tulle fabric. Because our Fashion Art Collection is manufactered locally, we will be limiting collection pieces, so if you love our concept please pledge now. Our campaign goal is the minimum that we need to launch our collection, but the more funding we raise, the more successful we will be with our product launch, regarding increasing our inventory, the creation of new graphic art, new fashion designs and a greater opportunity for online marketing. If our campaign ends up over funding (which is great!) it could take a little longer to fulfill orders according to our time line chart. We will make sure to update you frequently about our progress, and we’ll be completely accessible for any comments and questions. SURVEY – Within a few days after the campaign is complete, you will be emailed a link to a Kickstarter survey. There you’ll provide us with your size(s), print design choices(s), and address, so we know what apparel piece(s) to send you and where to send them. This is one of the most important steps so please submit this information as soon as possible so that we can order our printed fabrics. We may also be asking a few questions relative to our campaign project. QUALITY - What’s great about our product is that we’ll be manufacturing all items right here in the USA and everything will be constructed locally, so I'll be inspecting every item for quality and correct sizing before we ship. SHIPPING – As we manufacture each run of our collection, we’ll be shipping the items according to how soon our backers pledged. Example: if you backed our campaign close to the beginning of the launch, you will be one of the first to receive your collection pieces. By pledging $1, You will be supporting our project and will receive all updates. You’ll be able to ask us any questions regarding our collection, and you’ll also be able give us valuable feedback and help influence and shape the future of our products with your comments. For Pullover Hoodie features see our presentation art board. You’ll choose Two SPORT FASHION PULLOVER HOODIES of any combination of either men’s or women’s and you’ll choose the prints or a solid colors, and sizes later. You'll receive 1 Front Zipper Hoodie. You'll choose one of 2 prints of art images #1 or #2 and size later. MSRP of $250. Free shipping in USA.